HMS BROADSWORD was a destroyer of the "Weapons (Battleaxe)" Class ordered under the 1943 Programme. Built and engined by Yarrow & Co Ltd, Scotstoun, Glasgow, she was laid down on 20 July 1944, launched on 5 February 1946 and completed on 4 October 1948. Of 1,980 tons standard displacement, the BROADSWORD was 365'0" in length, with a breadth of 38'0" and draught (aft) of 17'1". Designed top speed was 34 knots with an endurance of 6,500 miles at 15 knots, 4,500 miles at 20 knots and 1,650 miles at full speed. Armament when built was 4 x 4" guns in twin mountings, 4 x 40mm Bofors in STAAG mountings and 2 x 40mm Bofors in single mountings. The BROADSWORD was fitted with 2 x 21" pentad revolving torpedo tubes for which she carried an outfit of 10 torpedoes. For antisubmarine warfare, she was fitted with 1 Squid mounting, for which she was out fitted with 120 missiles, and 1 rail with an outfit of 15 depth charges. In 1953 2 x 4" guns were removed together with the depth charge equipment. In place of the single Squid fitted, she was fitted with a double Squid (Port and Starboard). In 1958 the torpedo equipment was removed. Upon completion HMS BROADSWORD was allocated to the 6th December Flotilla. She first went to Portsmouth and in November to Chatham where she was taken in hand on 29 November for completion of modifications, the work being completed on 31 December, the then left for Portland and thence to Campbeltown. In June 1949 she was attached temporarily to the 3rd Destroyer Flotilla for gunnery trials off Malta, returning to the UK in early September to rejoin the 6th Flotilla. On 29 May 1950, after the Home Fleet Spring cruise, the BROADSWORD left the UK for Norfolk, Virginia, to be attached to the US Operational Development Force, mainly for gunnery trials. She left the USA on 21 August to arrive back at Sheerness on 1 September. After a short docking the BROADSWORD took part in the Home Fleet Autumn cruise. In 1951 and 1952 she took part in Home Fleet cruises and exercises. In April 1953 HMS BROADSWORD was reduced to the Reserve at Chatham. In August 1953 she was placed in a state of preservation and dehumidification. Then in August 1955 the BROADSWORD was removed from the Special Reserve. In November 1956 the BROADSWORD was towed to Rosyth for refit, not completed until October 1958. On completion she was allocated to the 7th Destroyer Squadron and, after work-up and trials, took part in the Home Fleet Autumn cruise. 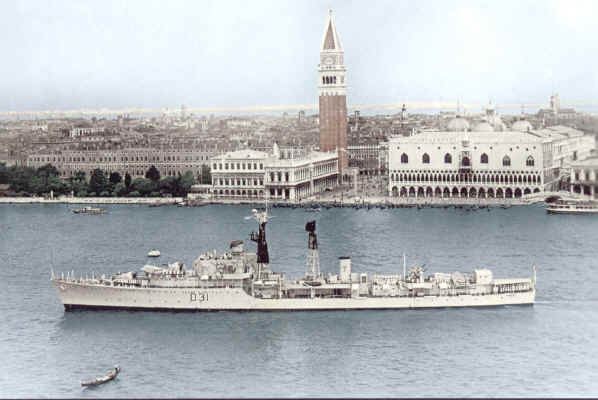 During the early part of 1959 the BROADSWORD was in the Mediterranean taking part in cruises and exercises. In April she returned to Portsmouth and thence to Chatham. The BROADSWORD was on the Iceland Patrol from 19 May to 3 June and again from 24 July to 12 August. She then went to Chatham for repairs which were not completed until the end of October. After a short period on exercises early in 1960 HMS BROADSWORD was transferred in March 1960 to the Mediterranean Fleet where she took part in many exercises and visits. On 29 July 1960 she gave assistance to the ss HARTISMERE after an explosion aboard the latter ship off Malta. In August the BROADSWORD was taken in hand at Gibraltar for a refit, the work not being completed until mid-November. On 25 March 1961 the BROADSWORD arrived back at Chatham having taking part in an exercise on her way home. During her year in the Mediterranean she had steamed 36,000 miles while engaged on NATO and National exercises. The BROADSWORD had a further spell on the Iceland Patrol from 6 September to 25 September 1961. She then took part in a number of visits and exercises. In April 1962 she returned to the Mediterranean Station, where again she took part in many exercises and visits. On 6 December 1962 the BROADSWORD left Gibraltar for Portsmouth, arriving on 10 December to enter the Reserve Fleet. On 24 January 1964 the BROADSWORD was placed on the Disposal List. In April 1968 she was towed to Rosyth where she was used for a time in connection with torpedo trials. On 18 July 1968 she was sold to T W Ward Ltd for breaking-up at Inverkeithing.